We have a special opportunity for players to hear from Mike Bryant the father of Kris Bryant. 2013 Golden Spikes, 2014 Milb Player of the year, 2015 NL ROY, 2016 NL MVP, 2016 WS champ. Kris is the only player in history to consecutively win these awards. Mike Bryant was extremely fortunate to spend time with Ted Williams as a minor leaguer. 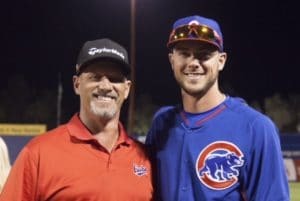 Mike has made himself available to share with us what he learned from Ted Williams, and what he has taught his son Kris Bryant. Ted Williams is widely regarded as The Greatest Hitter who ever lived. Please join us for a really informative, fun packed two hours on Sunday September 16th from 4-6 pm at The Hitting Institute at 9171 E. Bell Road Suite #109 Scottsdale AZ. The cost of the clinic will be $40 total for Father (or Mother) & Son to attend. To reserve a spot please call or text Geoff Grenert 775-250-2136. We have a limited amount of space so please reserve a spot ASAP.